Copycats Media and Tinderbox have announced their RedGorilla have announced their SXSW day party. 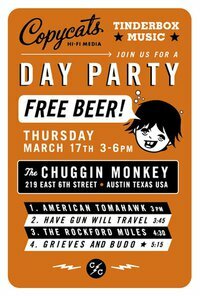 The party requires an RSVP and takes place on Thursday, March 17th at the Chuggin Monkey. Lineup and more after the jump. The Chuggin Monkey – 219 East 6th Street – 3:00 – 6:00 p.m.
American Tomahawk – 3:00 p.m.
Have Gun Will Travel – 3:45 p.m. The Rockford Mules – 4:30 p.m.
Grieves & Budo – 5:15 p.m.